Death (R) – If you are feeling depressed – it is because you are stuck in your old habits and lack any real motivation. Depression and boredom conceal your “inner” fear of change. Deliberately and consciously release any excess – remove the things which have become heavy and stagnant and rid yourself of mental clutter. Let go of outdated ideas and excessive “thinking”. Let go of any restrictive, oppressive, limiting attitudes and beliefs. Create a space for new opportunities to come in. Accept that you need new ideas – accept that there will be success. Things WILL change with organization, time and hard work. Come to grips with your life – allow nothing to slide. Your hands may be tied – but never your mind. Make new goals, consider all the aspects of any new venture and always keep your mind actively planning for the future. You create change through your imagination and it is essential that you imagine yourself as you would like to be if you wish your “inner” powers to support you. Release yourself from your old “ego” habits. Take off the “old” mask so that a new one can be created. All the levels of your life have been important in producing the level that you are working on now. Transformation is necessary to create the desired change – to create new growth, liberation and renewal. Release your sense of “self” now so that you can merge with the Universe. Use your inquiring mind and trust that overcoming these obstacles will lead you to knowledge and liberation. Stop fearing change and wasting your energy. Consciously direct your energy towards energizing those things that will work for you. You will never be lonely if you avail yourself to the wisdom of your Higher Self. Listen to your “inner” guide – it holds the answers to all your questions. Can mean no change where change is needed – a “block”. The negative face of fear which can be traced to the root fear of death. Physical insecurity – closely linked with matters of health, work and home. False courage at one extreme, cowardice at the other. What is your basic support system through this transition? What new growth is now possible? What are you feeling so deeply and intensely about? In the first position: Free spirits are assertive and you are very much in tune with them. In the second position: Perhaps you have not been in tune with nature and basic rhythms. Death as an issue behind you is resolved. In the third position: The matter at hand requires your participation, but you are not the principle character. In the fourth position: To love or to welcome death in its extremes (too much or too little) leads to some of humanities most disturbing potentialities. An over fascination and embrace of death leads, on the lighter side to a love of danger with greater and greater risk to life and on the darker side to things like necrophilia, murder and suicide. To welcome death too little is to fear death and leads to weakness, cowardice and in the extreme a fear of the least little things and eventually life itself. 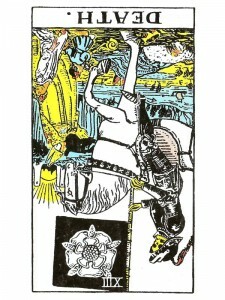 In the fifth position: Death, fear may be playing on the mind in a very counterproductive way. Do not avoid the subject; air it and face it. In the sixth position: At one extreme, the heart may want to look back too much – or, it may be ignoring the past and what has happened instead of integrating it. In the seventh position: There may be fear of this change. If the mental fear is great enough, it can stall the effects the change was meant to implement. The change cannot however be reversed or even compensated for – it must be embraced. In the eighth position: Change has been stalled or its effects rejected, not internalized. In the ninth position – A fatalistic heart, heartache over change, a reluctance or inability to internalize a death – the lesson of death. At the other extreme, there can be an over – enthusiasm for this archetype, embracing too much change too quickly. In the tenth position: The fears you are experiencing are legitimate and you will be able to navigate safely having heeded them. No need to put on a face of false courage.